Today was the last of our Field Trip to Middle School for the incoming 5th grade class. Transitioning the 4th graders actually started a few weeks ago, when my Principal, one current 5th grader, and myself went to talk at a 4th grade assembly. While we were there, my Principal and I introduced ourselves and our roles, then I introduced our 5th grader. She and I fielded many questions about what it is like in the 5th grade. We visited with the 4th graders for about an hour before returning to the middle school. Now, although it is about a month later, we just finished hosting part 2 of our transition plan--Tour of the MS building. Last week, I sent each 4th grader a Boarding Pass to Middle School. I actually typed each student's name onto the pass. I thought the passes would be a nice "souvenir" of their transition and remind them of when they would actually be visiting with us. Different classes came on different days, so that info was on each Boarding Pass as well. 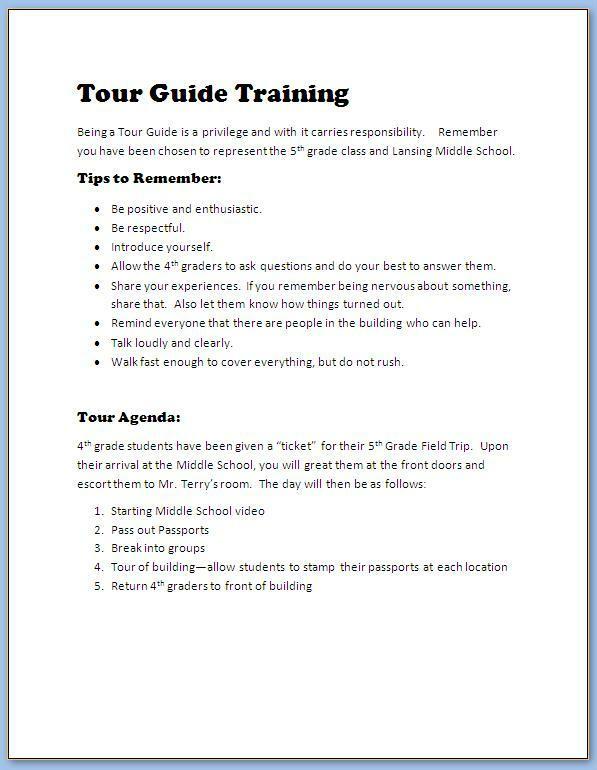 passports, broke the students up for tours and away they went! I picked, with the help of the 5th grade teachers, 19 fifth graders to help give tours after school for the 3 days the 4th graders came for visits. Last week, I held a Tour Guide Training During lunch. 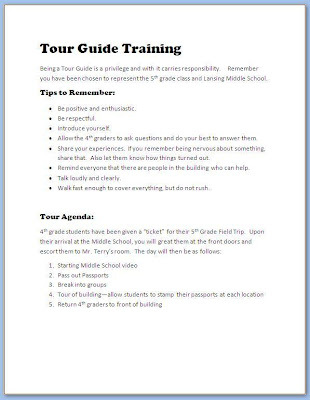 I did find the idea for the boarding pass and field trip form online through Pinterest. The last 3 days were a huge hit. We did tweak a few things along the way (made smaller tour groups and pre-stamped all the passports) but I think both the current 5th graders and next year's 5th graders got a lot out of the sessions. You can find this (along with a lot more transition materials on my TpT store. Just click HERE. What an awesome way to make new Middle School students feel welcome and important! The 4th graders did feel important, but so did our 5th graders. It was also a great opportunity for them to develop some leadership skills. Really the past 3 days were a win-win situation. These items are fantastic and clever. What a great way to get rising middle schoolers excited for the year ahead.